Aim: Why is climate a major influence in building structure? 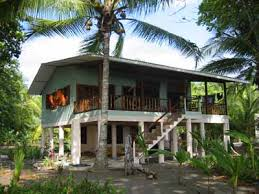 • Tell the different materials Costa Ricans use to build houses/buildings and why. • Explain how climate, people and culture affect architecture. Assigment: Read the following text and complete the activity #1 on the attached handout. Then read the instructions of the mini-project. 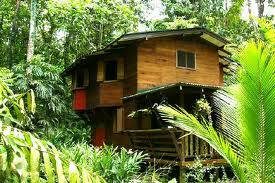 The earliest architecture from Costa Rica was made of wood and has not lasted to the present day, although along the coasts some people still build wooden stilt houses. The region is fairly mountainous, volcanic, and bordered by water so the indigenous people lived there in small numbers. Of the few people that lived here, their houses and other structures have rarely lasted over time. Only the archeological sight of Guayabo, which is only home to stone foundations, has survived. With the arrival of the Spanish in the 1500s the Spanish architecture was introduced to the region and numerous Spanish-styled buildings were built, most noticeably in the regions of Liberia, Heredia, and the towns of Cartago and Barva. The Spanish buildings varied; many churches were built in the styles popular in Europe and Spain when they were built, leaving a strong legacy of Baroque influenced buildings in Central America. The 1800s received a number of large coffee plantation mansions and a few Neo-Classical buildings. These mansions are found in the hills of the country as they dot the mountainous landscape. The Neo-Classical buildings though are limited to the larger cities. The Teatro Nacional (1897) in San Jose is perhaps the best example of this style in Costa Rica. In more recent times the architecture has been more reflective of modern technology and materials, especially in the capital of San Jose, which is home to most of the country’s modern and post-modern architecture. In fact San Jose is home to nearly every architectural movement in the 1900s and 2000s as it hosts everything from Art Deco buildings and modern structures. It is the one that establishes a harmonious relationship between Nature and Man. Costa Rica is, indeed, a tropical country with a wide variety of microclimates and elements to take into account. The main feature of the tropical experience is the close contact with the outside that leads to the feeling of openness and naturalness. 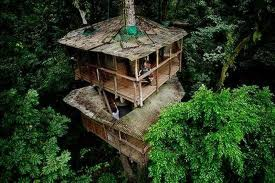 Costa Ricans Architects must consider that country’s specific climate and topographic variations as well as the surrounding environments in order to create appropriate structures seeking a harmonious integration that diminishes the impact of human alteration on the ecosystems. Constant pursuit of wind and shadows as well as considering sunlight and rainfall, topography and use of vegetation is essential for its vibrant aesthetic effect, privacy and acoustic insulation if desired. Natural cross ventilation, proper orientation on the site, quick and efficient rainwater evacuation, breeze-cooled interiors and to generate large shadows, represent some of the main factors that characterize the tropical architecture in the present. They use local material and techniques to integrate into the local ecosystem and take advantage of all the favorable conditions of the climate and geography to achieve comfort in a natural way. Steel, concrete, and block: The most common construction materials you’ll see used here are structural steel, poured concrete, and cement block. Partly this is out of tradition, partly from climate, partly due to Costa Rica’s character as a seismic zone, and partly from legal and geographic conditions that can do odd things to the pricing and availability of otherwise common materials. You’re almost certain to be able to find these materials available anywhere you build in the country. Their cost, however, is never a sure thing. Global demand for steel has skyrocketed, increasing the local price. Likewise, high energy costs keep pushing up the price of concrete and block. Even so, you’re likely to find that these are the most economical and common construction materials, as well as the ones most familiar to construction workers. Tin and tile: By far the most common roofing material is metal sheeting. Even large, expensive houses have this kind of roofing. Apparently it’s cheap. It’s also light, which means your roof spans can be wider. The downside is that it makes an incredible amount of noise when it rains, and it looks awfully ugly when it starts to rust. Clay tile is the other kind of roofing you see most commonly in Costa Rica. Clay tiles look attractive on neo-colonial style homes and they last for years. But they’re quite expensive, difficult to replace, and very heavy, which means tile roofs are either small or supported by huge steel or timber beams. Tile is also architecturally quite a bit less versatile than zinc. Some of these problems have been resolved with the invention of plastic roof tiles that look like the clay ones, but again, by definition their use is limited to the neo-colonial style homes. Wood and gypsum: Houses with interior walls made of gypsum board are becoming more common, perhaps understandably, as block and concrete continue to become more expensive. Wood, however, is a complicated material in Costa Rica. When the population was smaller and environmental laws perhaps not so strictly enforced, wood was the go-to material for furniture and some houses. Older middle-class houses in many parts of the country commonly have wooden ceilings made out of tropical hardwood, and even older houses in high-end neighborhoods and former banana company settlements are made entirely of wood. But today, stricter regulation of tree-cutting and greater demand have turned wood into a costly building material that’s mainly used for accents, furniture, and the occasional floor or balcony. Walls made of gypsum are supported by metal studs, not two-by-fours. Windows: Lacking, as it does, a harsh northern climate, windows in Costa Rica are simple affairs, with basic aluminum or wood frames and either a single pane of glass or glass slats. Depending on where you are in the country, you may need to put bars on the windows or some sort of security system. Flooring: Most typically, Costa Rican houses are finished with Spanish style-tile floors. Carpet is around, but not used very often. When it comes to tile, you’ll have a whole range of choices, and it’s up to you to decide what you like best. In addition to tile flooring, other options are starting to pop up in the market. Plastic laminate flooring is now available, as is wood laminate. Wood flooring is always an option as well.